The Compaq Presario 2210US notbook offers equal parts mobility and productivity, with a price tag that won't break the bank. Road warriors will appreciate the power-saving benefits of the 1.4 GHz Celeron M processor, while digital media enthusiasts will go for the bright, 15-inch display and 24x combo CD-RW/DVD-ROM drive. It also features a 40 GB hard drive, 512 MB of installed RAM, and 54g Wi-Fi connectivity. Hard Drive: The 40 GB IDE hard drive is on the small side compared to other notebooks. However, it does offer a decent enough capacity for storing documents and productivity software for road warriors--but not enough for much multimedia storage. Processor: The younger sibling to Intel's Centrino processor, the Celeron M processor is also closely related to its desktop and Mobile Celeron predecessors. The 1.4 GHz speed measurement is similar to the 2.0 GHz Mobile Celeron processor, which puts it in the middle of the speed spectrum for this processor class. It will aby execute tasks from productivity and multimedia applications, but it's not recommended for high-end video needs. Its M classification denotes its built-in power-saving technologies, so you'll get good battery performance while on the road. Memory: The 512 MB of built-in memory (2 x 256 MB, 266 MHz, DDR SDRAM) is becoming standard on notebooks and it's a good start for power users. It has two memory slots in total, with a maximum memory expansion up to 1 GB (2 x 512 MB). CD/DVD Drive: The combo CD-RW/DVD-ROM drive can write and read CDs at 24x and rewrite at 10x speeds. It can read DVDs at 16x. Keyboard & Mouse: This notebook has a standard 101-key keyboard and two-button touchpad with on/off button and dedictated vertical scroll up/down pad. The 2210US has a 15-inch TFT display with a native resolution of 1024 x 768 pixels. It also features the integrated Intel Extreme Graphics 2 video/graphics card (with 8x AGP and 64 MB of shared video memory), 16-bit Sound Blaster Pro-compatible audio, and internal stereo speakers. It also has an integrated 56K modem (V.90) and an RJ-45 LAN network port (for a 10/100 Ethernet connection to networks and DSL/cable modems). It also has a hot-swappable bay for adding an optional optical drive or second battery. This system comes with the Windows XP Home Edition operating system, and it also features Microsoft Works (for working with word processing and spreadsheet documents). Other preloaded software includes Microsoft Money, Quicken New User Edition, Norton Antivirus 2004 (with 60-day LiveUpdate subscription), Adobe Acrobat Reader, Encarta Plus, HP Image Zone Plus, InterVideo WinDVD Creator,Sonic RecordNow, and Apple iTunes. At 12.96 x 10.72 x 1.69 inches and 6.7 pounds, the 2210US is average in size compared to other notebooks in its class. It's powered by a 6-cell rechargeable lithium-ion battery, which provides an average of battery life of around 2 hours (depending on usage). It's thin (only .50 inches thick), it's light (only 4.23 ounces), and it's bright, with a clear and dazzling transreflective color display. The iPAQ H1910 Pocket PC offers a great combination of features and distinctive design that fits your lifestyle. It allows you the freedom to access essential personal information and entertainment at your convenience. The HP iPAQ H1910 Pocket PC comes with a 200 MHz Intel XScale processor, 64 MB RAM, 16 MB flash ROM, and a Secure Digital memory slot for additional memory. The display is a color transflective TFT LCD, 16-bit touch screen, capable of displaying more than 64,000 colors with 240 x 320 resolution. Programs installed on the Pocket PC include: Microsoft Windows CE, Calendar, Contacts, Tasks, Voice Recorder, Notes, Pocket Word, Pocket Excel, Pocket Internet Explorer, Windows Media Player (for playing MP3 files), Calculator, Solitaire, Inbox (for e-mail), Microsoft Reader (eBooks), File Explorer, MSN Messenger, Terminal Services Client, VPN Client, Infrared Beaming, Clock, Align Screen, Memory, Volume Control, iPAQ Task Manager, iPAQ File Store, iPAQ Backup, and iPAQ Image Viewer. The iPAQ H1910 comes with a slim removable battery, a USB synchronization cable, an AC adapter, a charging adapter (tethered to the AC adapter), a quick-start user's guide, and an HP iPAQ Pocket PC Companion CD-ROM (including Microsoft Outlook 2000, ActiveSync 3.5, add-on applications, and a reference guide). 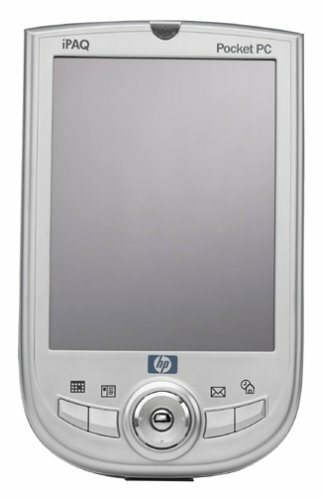 The HP iPAQ H1910 comes with a one-year limited warranty. I bought HP iPAQ 1910 Pocket PC about 2 months ago. I talked to all the sales rep at the computer store & electronic store such as Bestbuy & Circuitcity about the difference between MS Window base & Palm OS base. 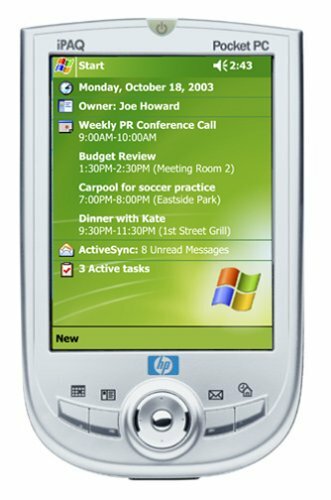 Everyone recommend the Window based model and specially this model (HP iPAQ 1910 Pocket PC). I didn't know anything about that at that time & I just bought it. I also have a friend who bought Sony Clie model which is Palm OS based. I guess he paid almost about the same price I paid to mine. We compared those two and we found out HP iPAQ 1910 Pocket PC is much faster, more memory... a lot better machine. He finally bought HP iPAQ 1910 Pocket PC (same as mine) for this Chistmas. He & I really like this pocket PC & you will love it, too. Well, got the new IPAQ yesterday in the mail. WOW, what a great little PDA. Other reviewers have talked about the wonderful features and such. However, let me share my initial experience trying to find some of the key accessories and features. First, missing from the product is any kind of protective cover. Drop this little gem the first time on a hard floor and its going to be toast. Checked the HP site and discovered they offer no solutions for the 1910 yet. Third party products look very bulky (so called universal solutions) for this very slim unit. Second, there is no built in JPEG file viewer. You must go to the the MS site and purchase a third party product. This viewer should have been bundled with PC 2002 operating system. Third, try as I might, find a way to delete files within the file exployer is not possible. I finally resorted to accessing the PDA from the desktop system to eliminate unwanted files. Forth, I discovered a website dedicated to tracking bugs in PocketPC 2002....there are lots of them [local website] and many are still unresolved. Bottomline: Love the size, price and screen...but not impressed by the lack of critical accessories and features of PocketPC 2002. I would have thought that this hot product would have had a better launch. I received iPaq as a birthday gift from my fiance.I know quite well about electronics. My initial impression was Wow.. The Display/Graphics is extremely pleasing.Navigation is very simple..so any starter who is not very techno savvy can operate this PC with ease.Since the operating system is Windows CE,its very simple to browse thru(as many are familiar with Windows GUI).The best feature ofcourse is Outlook Syncup (must for all Pocket PCs ofcourse) but its easy and quick.The software installation is not too difficult either.The sound quality is good and works great with a Secure Digital card as well. The conventional "CROSS" at Top,right hand corner doesnot stand for "Closing" of the program but it means "Minimising" the screen.That leaves your program still running in Backgroud.So even if the display shows your "desktop" (Today screen) there are functions running in backgroud...This will make your PC freeze often if many programs are running. This PC freezes very often and I have to reset it then. If it freezes real bad then you will have to Hard reset it which means your data is lost. So I would suggest that "Stop" all the running programs at certain intervals..You have that option in "Settings". I would advise one to buy it. I've had mine for 1.5 years, and it's very useful, except for one problem. I can't sync. At all. At first it synced fine, but after a while, I had occasional problems and would have to spend hours getting it to work, because my comp would not be able to find the device (I've found many reasons for this, and trust me - they are a pain to chase down - even fluff in the connector and an iffy signal to the interface will do the trick). This time, I've spent a week of evenings searching for the solution. When I checked the HP Web site, this item was totally lacking in help, I believe because it is no longer sold. My comp is fine, the device is fine, and the Activesync is there - they just are not speaking. I call this the "family feud PDA" - they are close, they are family - they won't talk. I've given up on it - bought a Palm-based product for a bit higher cost. So easy, plus it has a camera, an MP3 player, and it syncs! * The stylus no longer clicks into place, that mechanism has apparently broken. The color screen is nice, but doesn't make up for the headache or the cost. I wish I'd just purchased another Palm V when my last one was stolen. Compaq has a winner here in the base technology but it needs a tune-up big time (which is happening as we 'sync'). Summarily, you get a cool little computer with a stubborn streak and a big mouth that can thankfully be turned down, with MUCH more space and operational capacity than a Palm, but still not enough for most people to call it Home. Thanks to the back light, you can actually >see< the information, which is a clever bonus. Unlike some PDAs, there is no drab olive-green screen to twist your eyes into pretzels. Its like you're in a little office with the flourescents on. The 'sync' software works (ok), just don't expect any pampering like the Palm people gave us with their one-button push sync. You'll work for this peanut, baby. It has the distinct flavor of rushed-out backroom benchmarking. So go ahead and stick MS Outlook in the Start-Up menu, cause she's a legend in her own mind and hates to be left out of the fuss (sync loop), (this is one thing, among others, they don't mention). If you get through the software installation, wait 30 or 60 seconds til blastoff, and make a connection, you might actually get to build a working relationship or two..but don't get comfortable. LOL. Hey, why can't the Compaq people invite the Palm people to a pool party, and let them explain how to make (like they did A LONG TIME AGO!!!) that INGENIOUS ONE-TOUCH SYNC BUTTON and that TOTALLY FUNCTIONAL (AND PRETTY) PALM DESK-TOP SOFTWARE, that makes you the king of your castle, not a serf in a wrestle. The bad news: you just heard some. The good news: It's a buyer's market baby on the 3670 due to the yard sales from the frustrated and upgraders - and after all, it is a cool little computer. So why not test your skills and pick one up? Take a hint from Nike..JUST DO IT!!!!!! Great unit - NO Battery Life. I've owned the Palm V (Monochrome)...Palm 505 (Color)...and the iPaq 3670 (Color). Now, the Compaq screen wins hands down. It's bigger since the keyboard and hand recognition areas hide, releasing the screen space for images, text, etc. Plus, don't forget the MP3 player, which the Palm does NOT have (I think they only beep, how embarassing). The programs are a bit memory hungry so it would be nice to have internal expansion for memory (64MB is really very little for this unit - the equivalent of 8MB in the Palm). Sounds weird, especially coming from an engineer, but that's how it feels. The Windows environment really gobbles up the memory. You can buy an expansion port that will hold additional memory, although with good management you can get away without expanding it. The only real problem that I have with this unit is the battery life. Well, actually, WHAT BATTERY LIFE? If you play any game for 1.1/2 to 2 hours...you're out of battery!! If you leave the unit, WITHOUT USING IT, overnight - for two nights - you're out of battery again! Did I get a lemon? Do they all work like this? Does anyone sell battery packs that also include memory expansion? How does battery life compare with the Palm, you ask? Well, the Palm 505 (Color) will last about a week with decent everyday use and a lot of playing each day. The Palm V will last about 2 weeks (yes, WEEKS), with average use. The iPAQ will last 1 to 2 days with average use (and I'm being kind). It's sad to see the best selling Pocket PC with such few options where accessories are concerned, shame on Compaq for not providing incentives to other manufacturers. Let's see how HP plays the game. Congratulations to the NEXICAM for bringing the first digital camera adapted for this unit. Now, they should have combined it with a battery pack, GPS, Cell Phone and Memory Slot - that way I could get rid of all the other gadgets that clutter up my night stand. Want the best ? If you can live with low battery life, then this is your unit. I have a car charger and 110VAC-12VDC adapter that goes with me when I travel or I lose access to my contact information while I'm away. I was lucky enough to receive this as a gift and was totally blown away by the capabilities of this device. The ActiveSync software is almost transparent and you never have to worry about remembering to sync before you head out the door. A few of my favorite features are the voice recorder, Windows Media Player for mp3's (headphone jack is very nice), and the "transcriber" option, which could even recognize a doctor's handwriting. There are a ton of cool apps you can download/buy for this device, including maps, wireless web software, etc. If you can shell out the $$ and are looking for a handheld with a VERY high "cool factor" please check out the iPaq 3760. Eye-catching as well as highly functional, Compaq's iPAQ 3765 Pocket PC features a powerful new operating system, CompactFlash expandability, and a fast Intel processor. Its 64 MB SDRAM and 32 MB ROM provide enough memory to hold a robust package of applications while leaving you a lot of room for your own applications. 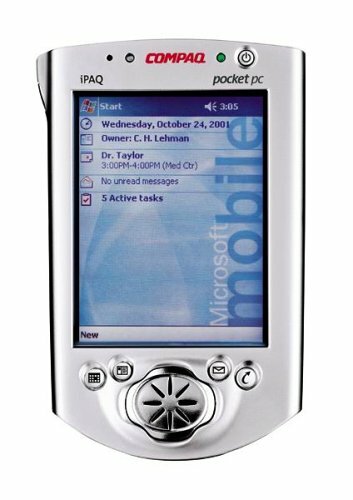 The enhancements and improvements in Microsoft's Pocket PC 2002 operating system make the iPAQ 3765 even more powerful and easier to use. You'll get improved handwriting recognition, more reliable synchronization, increased security, and the ability to chat via MSN Messenger. It also features new Pocket versions of Outlook, Word, Excel, and Internet Explorer. Work hard, but play hard, too. The iPAQ 3765 can play digital audio files (both MP3 and WMA) using the Windows Media Player software. It's also compatible with audible.com files, for listening to audiobooks, radio broadcasts, and more. You also get the Microsoft Reader e-book software. The color TFT screen produces 4,086 colors, and you can view the screen from many angles and in a variety of lighting. Using the optional expansion jacket, you can add memory and modules--such as modems and cameras--using CompactFlash cards. Other highlights of the Compaq iPAQ include a microphone and a speaker, as well as an audio-in jack. It features an infrared port for wireless data transfer. The Compaq iPAQ uses five buttons plus a five-way joystick. The iPAQ connects to either USB or serial ports. The iPAQ allows you to input data in your own handwriting, by soft keyboard, or by voice recorder. Both audible and visual alarms alert you to a scheduled event. At 5.11-by-3.3-by-0.62 inches and weighing 6.3 ounces, the iPAQ 3765 is sporty and small, fitting in your hand or sliding into your pocket with ease. Compaq has also built in utilities so that frequent actions--such as switching between tasks, adjusting volume, and changing backlighting--are only a click away. The iPAQ 3765 has a built-in lithium rechargeable battery that gives up to 12 hours of battery life. It also comes with a docking cradle, AC adapter for battery charging, and a USB connection cable. Compaq offers a one-year warranty on parts and labor. It' s very useful for daily life, I'm graduated student. I always use this thing for my lecture. You can use Word, Excel, Powerpoint in this machine. The best thing I will say is it's very easy to use because one of my friend use sony clie 760, and he told me to teach him uninstall the program for his machine, but I couldn't do it, because it's very difficult to do, but for iPaq you can use it easily like your desktop because of Window OS. 5. A lot of accessories. 6. A lot of good utilities programs. 1. Short battery life just couple hours. 4. I sometimes miss my appointments because I didn't hear reminder sound. 5. It'll be very too big to carry with compactflash jacket . I absolutely recommend this product . I use it to manage my time schedule, banking account, dictionary, MP3, game, and Internet as well as MSN messenger. This product is much better than Palm pilot. I purchased this IPAQ about a month ago to use at home, work, and college. The main feature I like is being able to consolodate all phone numbers, contacts, and Microsoft Office documents into one little device. I've eliminated reems of paperwork with my IPAQ and I'm very glad I purchased it. BUT the support from Compaq is terrible. I'm a Social Worker, NOT a computer programmer. Yet my IPAQ comes with a small owner's manual and very little useful online advice that is actually written in plain English. Navigating their web site is tricky. The PocketPC software (Microsoft) is mostly straightforward and easy to use (ingenious really), but there's no simple way to schedule an appointment with your contacts--why not? Isn't that why you buy a handheld computer? Word of advice: If you're going to be using your IPAQ more than 4 hours a day, then you might want to upgrade to the IPAQ H3850 simply because the 3850 has a much longer battery life. My battery dies within about 2-4 hours on LOW power. The problem is you have to keep the unit charged to about 40% so it doesn't permanently lose all the data. Either upgrade to the 3850 or buy several AC adapters to charge the thing. Even with all the complaints, I love the fact that my IPAQ has made me a much more productive student and employee. The Compaq iPAQ 3765 is an amazing PDA. Well, it's not really a PDA, it's an actual Pocket PC. You have to see it to believe it. It's got Pocket PC 2002, and it's awesome. It's got Microsoft Pocket Word, Pocket Excel, and basically Pocket outlook just spread into mini programs. 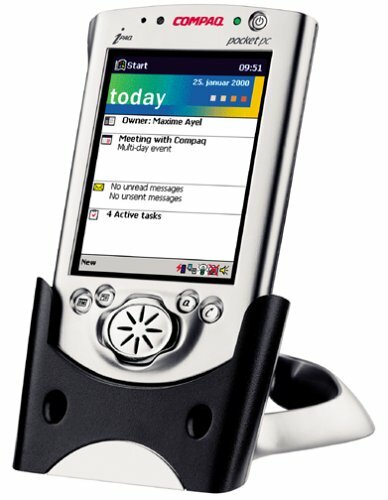 If you don't want to sit at your computer and read your emails cause your in a rush, just sync your computer with your pocket pc and your ENTIRE inbox will be synced to your iPAQ. I basically created my iPAQ into a super iPAQ. I got the keyboard(which is fantastic), the dual slot flash card expansion pack, a 256 meg flash card, and a MGM flash card reader. A Palm pilot is NOTHING compared to what this thing can do. THey have so many application for this pocket pc. You can play your MP3's on windows media player, watch movies or clips on PocketTV(Download the software), Play games such as the Famous Age of Empires(INCREDIBLE) Rayman, Packman and many more. Print with it, play multiplayer games, make cartoons on PocketFlipbook(Download) surf the net(Need wireless), and more. Plus they now have mad an espansion card so you can get PHONE SERVICE on it. This is one of the greatest Technological creations ever. It helped me tremendously when doing my school work, This is because I could type notes on it (with an ipaq compatible keyboard, not included) without using a BULKY and indiscreet laptop, and easily EDIT my notes (sooo awesome and better than using the old fashioned wire-bound paper notebooks) when I transfer the notes to my computer. Highly recommended for students. BUT, the aspects of it that helped me in school are ones that you could find in almost any PDA retailing about $150 and up (due to "DocumentsToGo" and "4.0 student" software. Both are very necessary for students). You see, I had a Sony Clie SJ20 before I upgraded to this, and I realized that both did the same in terms of school work. 1) an expansion pack: WHEN YOU ADD THE EXPANSION PACK, FORGET THE TERM "POCKET PC" BECAUSE IT WILL NOT FIT WELL IN YOUR POCKET. It also makes it heavy. I hate the expansion pack because it's so bulky, and you can't find any cases on the market to fit the ipaq and the expansion pack, except for the case made by the manufacturer. I actually considered making my own case for it (because I'm into arts and crafts) just so I didn't have to spend more money on a case. Due to the expansion pack, I wanted to upgrade to one of the newer and smaller models of the ipaq because the unit is so indiscreet with the expansion pack. 3) And setting up the internet service you will get (your new account) through a phone company. Hard for me, some places don't do internet access through pocket PCs. Not to mention that the expansion pack is another $70-100 added onto the original price of the ipaq, and there's the price of the aircard and internet service (so monthly payments mean more money added onto the unit). So, when the company says, "internet access", be very wary of what you're getting into because a lot of leg work and money is involved. In total, the things previously mentioned are four extra things that would have made me not buy the ipaq if had known about them before. The other thing I wasn't satisfied with is the windows media player, on which you can play MP3s. You can only play about seven of them, unless you install more memory (and getting more memory means getting a memory card, which means getting a dual slot expansion pack, which means more BULK...uggghh). I haven't tried a movie or any visual on it yet. The battery power dies out quickly as well. So be prepared to see the "main battery low" sign appear on the screen every couple days or so (with regular usage). Overall, if you want true satisfaction with this product, be willing to spend an extra $200-300, in addition to monthly internet service payments, and go through a lot of leg work. Hit the road with the powerful, affordable Compaq Presario 2199US notebook PC and be confident that you have all the tools and documents you need to stay productive. The 2199US offers a 15-inch display, a battery-saving 2.13 GHz Mobile AMD Athlon XP-M processor, a DVD-ROM/CD-RW combo drive for playing DVD movies and burning your own music CDs, 40 GB hard drive, and 512 MB of installed RAM. Hard Drive: The 40 GB (4200 RPM) hard drive will be serviceable, providing ample storage for your documents and productivity applications, but it is on the low end of storage capacity when compared with other notebooks. Processor: The 2.13 GHz Mobile AMD Athlon XP-M processor is designed to extend system battery life using AMD's proprietary PowerNow! technology, as well as support a wide range of wireless LAN standards--including 802.11g (54g)--and Bluetooth connectivity. Memory: The 2199US comes with a 512 MB built-in memory (2 x 256 MB modules, DDR SDRAM, 266 MHz)--a good start for power users. It has two slots for upgrading memory to a maximum of 1 GB (2 x 512 MB). CD/DVD Drive: It comes equipped with a combo DVD/CD-RW drive, which enables you to play DVD-ROM discs and DVD movies as well as burn data and record music to CD discs. Keyboard & Mouse: The 2199US has a 101-key keyboard and touchpad with on/off button and dedicated vertical scroll up/down pad. 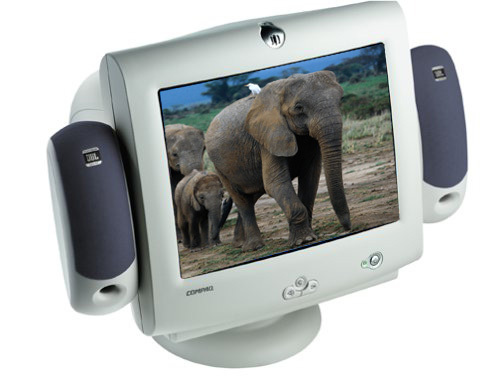 The 2199US uses the ATI Mobility Radeon 4x AGP video/graphics card with 3-D architecture and 64 MB of shared DDR RAM, which provides good DVD movie playback and the ability to drive an external monitor. It has a 15-inch XGA TFT screen with a 1028 x 768 native resolution. The audio card is integrated into the notebook's circuitry, which helps save on cost. The 2199US features two built-in stereo speakers. It also has an integrated 56K modem (V.92) and an RJ-45 LAN network port (for a 10/100 Ethernet connection to networks and DSL/cable modems). The 2199US comes with the Windows XP Home Edition operating system, and it also features Microsoft Works (for working with word processing and spreadsheet documents). Other preloaded software includes Norton Antivirus 2003 (with 60 days of complimentary live updates), Quicken, Microsoft Money, Microsoft Encarta Online Deluxe, Adobe Acrobat Reader, InterVideo WinDVD SE (for playing DVD movies), Roxio EasyCD Creator, and MusicMatch Jukebox. Measuring 12.96 x 10.72 x 1.62 inches (L x W x H), it's a relatively compact laptop. It weighs a moderate 7.3 pounds. The included rechargeable lithium-ion battery has 8 cells (which refers to the number of charge-storing components within the battery) and offers a standard amount of power for a notebook PC (around 2 hours of typical use). I got this laptop recently and I am very happy with it. 1) 15 inch display. It is very clear. Brightness is easily adjustable. 3) 512 MB RAM. You can really notice the difference over 256 MB ones. 4) Low price. Other notebook offering CD-RW/DVD combo, 40 GB, 512 MB RAM and fast processor are all generally $200 - $300 more expensive. 5) Relatively good battery life. I have gotten 2.5 - 3.75 hours of battery life. It really depends on what you do. If you play games, it will probably only last 1 hour. I have gotten 3+ hours of batter life watching movies on lower power setting. I use crystal CPUID to set the power setting instead of PowerNOW. It gives me more options, but also give you a chance to fry you CPU if you mess up. 1) USB 1.1 port and no firewire port. Basically means you cannot have fast access to external data. If you plan to do video editing, you will have to buy a firewire PCMCIA card. USB 1.1 is much slower compared to USB 2.0. Still, you should be able to get by to use with a digital camera. 2) High power consumption processor. This XP-M 2800 processor has a peak power consumption of 72W (compare to around 25W in Centrino). This puppy gets hot when running processor demanding applications. Mine CPU temperature have reached 82 degress celsius. 3) Integrated graphics card. Amazon mis-printed the graphics card for this unit, unless amazon.com gets different configurations from what I got. My unit has a RADEON IGP 320 integrated display card. It is not very fast, but still able to play some games depending how picky you are on video card. If you are getting a laptop to play the latest games, this laptop is not it. 4) The touchpad espically the scroll area is terrible. Whenever I try to type, my palm is on top of the scrollbar region of the touchpad causing my window to scroll up and down randomly. My only remedy is to disable the touchpad scrolling feature. All HP/Compaq had to do it to move the touchpad to the left 0.3 inches to solve this problem. I do not know what were they thinkging. 5) No integrated wireless card. Not a big deal. You can buy a PCMCIA with all the money you saved. 6) No docking station port. Probably not a big deal for most people. First off, there are many things to love about this pda. The fingerprint recognition is really cool. It works perfectly for me, and I don't have to worry about remembering a password or having it stolen. The integrated bluetooth and 802.11b is an excellent add-on, and hasn't added to the bulk of the device at all. There is a large amount of built-in memory, the display looks beautiful, the battery is swappable, and there are a lot of nice applications built in. What disappoints me with every ipaq is the low reliability. It is so poor that I would never personally spend my own money on one of these devices. I typically have to hit the reset button on my ipaq several times per day, becuase under heavy use the thing will freqently slow down or completely freeze up. You can't blame third party apps for these faults, since I am commonly using the standard features of my ipaq when these faults occur. My first two ipaqs died within about a year of purchase. The first one had a battery go bad, and since it was built into the device I could not swap it myself. The second one just stopped working. I could turn it on, but it basically just gave me a blue screen of death and nothing more. I love what the ipaqs offer, I just wish HP could get their act together and make them work as they're supposed to. I replaced my Sony Clie with this machine for few different reasons. I wanted a longer battery life, better software, better screen, more memory, expandability and better accessory compatibility. And I got all that in Ipaq 5555. Battery lasts a long time and put many devices to shame. It is also user replaceable which allows you not only to use extended packs but if for any reason your power pack fails you can replace it on your own without sending your device for lengthy warranty service. So far PocketPC operating system has been stable to me and very easy and intuitive to use. Most of the software I got for it provides easy and painless installation. Erasing files and keeping everything organized is also very easy. For some reason Palm devices always have very little memory. 5555 comes with whooping 128 megs and with right memory card your options are unlimited. For example I use it with 256 SD card. There are a lot of after market accessories available for IPAQ made either by HP or by third party manufacturer. You have to watch out for HP accessories because some of them are not directly compatible with 5000 series. They have an external battery charger that states compatibility with 5555 yet it is not, but it is compatible with expansion pack (one that includes battery). Bluetooth and wireless LAN work fine and allow you to almost always be connected. Unit is very solid with it's aluminum housing and case that is supplied with it besides being a really good deal protects the Ipaq the right way. My biggest complain is that 5555 is on the bigger side. It is a big PDA and coming from the smaller machine it is a slight disadvantage. I also have to rave about the screen. It is super bright, with excellent contrast and color definition. I kind of dislike the finger print security and perceive it as useless although cool conversation starter feature. So how do I use my Ipaq? I work both as a web developer and EMT. Ipaq holds my medical and drug reference books for street work, basic software for web developing, few games, mp3s and tons of email, contacts, notes, pdfs, docs and excel files. I use it on the street to jog down info, cross reference medications and to keep records. I use it in the office for everyday routine stuff. On the train or when I get bored I play some games. It is a good machine and with few extra accessories (car charger, memory card and keyboard) it will last you forever (or at least until 6666 is out). Great while it works. Mine died after 9 months of casual use. I'm not looking forward to dealing with warranty repairs. This is a great Pocket PC if you can afford it. I really like this Ipaq. I've had a 3835,3955,2215 and now this. This Ipaq really rocks.The integrated wifi and bluetooth makes surfing the net very easy. Even with the zippy 2215, I had trouble getting wifi due to a very obstinate wifi sd card. There's something to be said for having integrated wifi. Not just that but the 128 mb really makes a difference. I no longer find myself checking the memory setting to see which program needs to go on sd storage. Speed is nice and the color display is beautiful. Battery life could be better and of course it would be nice to have a compact flash but I'm pretty happy with the product. I would like to comment on reviewers who claim that the technical support is junk along with the device's reliability. May I point out that it is Microsoft's operating system, which is to be expected as no operating system is perfect. The iPAQ's hardware has nothing to do with how many times a reset is needed, since it has not only more ram, but a faster processor than most other pda's currently on the market. As for the technical support, I have had two iPAQ's and always received the same friendly and careless help needed to fix my problems straight away. Here's a recent example of how HP's support works. 2. Call to HP, they check warranty (lasts a year). 3. They send you an empty box, shipping and parts replacement, 100% free. 4. Ship it out next day. 5. Repair begins and ends in under an hour. 6. You receive an email confirming depature and repair success. 7. You receive the iPAQ back, only having it leave your side for less than 3 days. If that's not service, then I don't know what is. I believe that many people are rude, arrogant, and are ignorant to their mistakes. I told the support technicians that I had dropped it and they said no problem, and replaced the screen, usb host connector, and battery all free of charge. Hope this helps your buying decision. In comparison to newer-age pda's including the Toshiba e805, the Asus MyPal, and the new Dell Axim, I hope you will regard my post only within HP and Compaq's products. This particular iPAQ is a giant leap from my Compaq iPAQ 3835, gone are the days of cradle synchronizing and wired connections. With Bluetooth and wi-fi I can synchronize and receiving data virtually anywhere. - it is not worth buying unless you plan on using all features, including the finger print scan, otherwise go with the cheaper 4100 series iPAQs. - is an 'upgradable' iPAQ, which means all previous software, cords/connections, sleeves (jackets), styli, and cases will work with this iPAQ. - has wi-fi and bluetooth built in, along with 128megs sd ram, and 48 megs rom, gives you extra storage space. - speedy processor and an sdio slot. This is probably the best purchase I have ever made. This Pocket PC is everything I ever expected and more!! It's very easy to use as well! It doesn't come with a case or a cover, so you'll have to find one or risk damaging your display screen. I got the Belkin leather case designed for this model for $11. If you're interested in upgrading to Wi-fi, you can get the SD (Secure Digital) Wi-Fi card for about $90-100. Update: I'm reducing the ratings to 4 stars because of the following: I mentioned earlier that you can go wifi by adding an SD wifi card for $90. I discovered later that the iPAQ H4155 already has built-in wifi and it only cost $400. In addition the H4155 has a 400mhz processor. If you are interested in wifi connectivity I would recommend you buy the H4155 instead of this one. I wanted to save money so I obstained from the h4155, but now I wish I had bought that one instead of this one. Not that this pocket PC isn't good, in fact it's great. But if you want wifi this isn't the right choice. 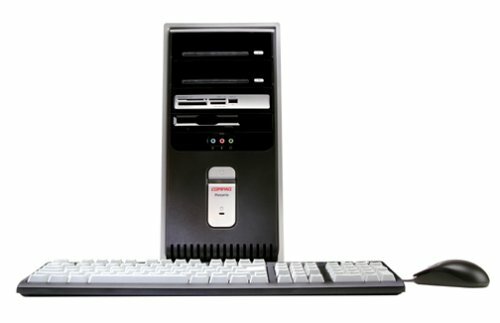 Whether editing your family photos, balancing your online checkbook, or listening to your digital music collection, Compaq's SR1420NX offers a versatile, strong base for your home computing needs. Focusing on affordability, the SR1420NX has room to grow with an available expansion slot, 2 available PCI slots, 5 USB ports for connecting peripherals, and the ability to add up to 2 GB of RAM. This desktop comes with an 80 GB hard drive, 512 MB of installed RAM, 2.93 GHz Intel Celeron processor, dual-layer DVD-/+RW drive (which also burns CDs), and a multi-format memory card reader. 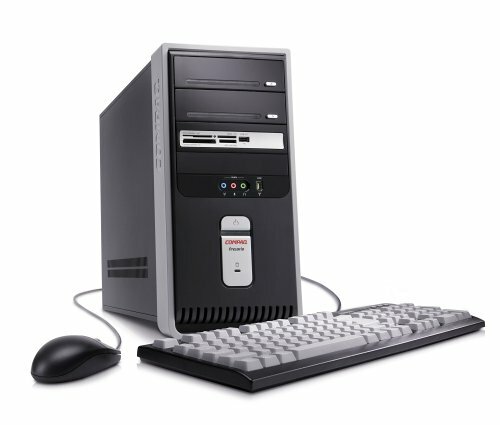 For a step up in price, the SR1430NX offers a Pentium 4 processor, 160 GB hard drive, and an extra CD-ROM drive. Memory: The 512 MB of installed RAM is a good start, but you'll want to take advantage of the roomy 2 GB of total RAM capacity (2 x 1 GB)for such multimedia needs as video editing and immersive 3D gaming. CD/DVD Drive: Offering the latest in DVD writing technology, the SR1420NX multiformat DVD/CD drive is compatible with both DVD+ and DVD- disc formats as well as dual-layer DVD+R discs, which can store up to 8.5 GB of data. It features16x DVD+R, 8x DVD-R, 4x DVD+/-RW, 2.4x DVD+R DL, 16x DVD-ROM, 40x CDR, 24x CDRW, and 40x CD-ROM ROM speeds. Keyboard & Mouse: The SR1420NX comes with a Compaq keyboard and scroller mouse (both with PS/2 connections. The HP iPAQ H3955 Pocket PC comes with a 400 MHz Intel XScale processor, 64 MB RAM, 32 MB flash ROM, and a Secure Digital memory slot for additional memory. The H3955's display is a color transflective TFT LCD, 3.78-inch, low power, 16-bit color touch screen, capable of displaying more than 65,000 colors with 240 x 320 resolution and .24 mm dot pitch. The H3955 comes with a docking cradle (USB or serial with AC power and charging), a 400 mAh lithium-polymer rechargeable battery, a touch-sensitive display, a soft keyboard, character recognition, handwriting recognition, inking, and a voice recorder. 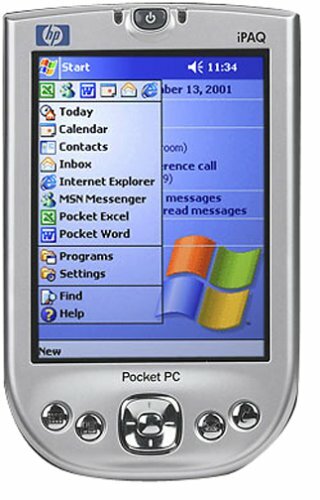 Programs installed on the Pocket PC include: Microsoft Windows CE, Calendar, Contacts, Tasks, Voice Recorder, Notes, Pocket Word, Pocket Excel, Pocket Internet Explorer, Windows Media Player (MP3), Calculator, Solitaire, Inbox (for e-mail), Microsoft Reader (eBooks), File Explorer, MSN Messenger, Terminal Services Client, VPN Client, Infrared Beaming, Clock, Align Screen, Memory, Volume Control iPAQ Task Manager, iPAQ File Store, iPAQ Backup, and iPAQ Image Viewer. Software included on an accompanying CD-ROM includes: Microsoft ActiveSync 3.5, Pocket Outlook 2002 (e-mail, calendar, contacts, and tasks), Microsoft Reader (eBooks), and Conduits Peacemaker Professional. I traded up from an Ipaq 3600 - it was getting too slow for what I needed. I hated having to use the expansion pack to add memory- I'm in the medical field and have 5 full textbooks on it- had to put it on the memory card. The expansion pack makes it too big and bulky and heavy. So I wanted a PDA with more memory and an integraded memory card. I left my 3600 charger in a hotel room and was forced to go manual for about 6 weeks! It was horrible!!! My new 3900 is wonderful- fast! I use Agenda Fusion for my calendar functions and the 3600 used to seize up all the time. I can put photos of my kids on the 3900 as well and all my texts are now right on the hard drive and I still have tons of space left over! I had planned to get a Toshiba before I read the reviews of the 3900- I can't afford sudden and total memory loss and I need a durable machine. I dropped my 3600 several times (after it was already slow) and it had no change in function. Thanks to everyone whose reviews convinced me to upgrade my Ipaq. Customer support from Compaq has been wonderful in the past also..... we have a laptop as well that has needed servicing- it's very simple. The 3600 seized up twice and had to be sent back and they replaced it no problem. That was another factor in sticking with them. Words cannot even begin to describe this handheld pc. Well, I'm over exagerating a little. If you wanted to get a pocket pc, I suggest you get an Ipaq. It has the most amazing backlight and it's amazingly easy to use. There's hardly nothing that can't be done with it since it can be expanded with different kinds of expansion slots. Buy an Ipaq. My main reason for writing this review was to actually thank the merchant that provided me her great service. Since it was too late for me to rate her using rate seller, I'll just rate her service here. I give yong2_wen2 a 5. Although I recieved the incorrect item at first, I was able to return the Ipaq and get the correct model with all shipping paid. yong2_wen2 was very responsive to every email I sent providing me with great customer service. Got this refurbished from Costco. Good screen etc. BUT, the power runs out every time you turn your back on it and there IS NO BACKUP (watch-type) battery. When the power runs out, you LOSE every program you ever installed, and the software walks you through an insultingly stupid nano-tutorial before you can use it again. Stupid design of the decade. Bought a stowaway keyboard for it and whenever the keyboard got near it, the Ipaq got flaky. Tonight the thing died again and I destroyed it (dead, it makes a better work of art than it ever did a PDA). Reason: I had to spend more time and effort reviving it than using it. A great concept with severely crappy reliability. This is a great piece of equipment. i would recommend it for any working person with a full schedule. you can use it for anything! i've even used it for sound testing for churches and such. Buy this product! its worth the money! i have had my share of POCKET PCs, PDA and even the CE devices. My very first PDA is the Casio Pocket Viewer, next is the Casio BE-300, after that i had my very first COMPAQ 3850 and now its the COMPAQ 3970. I kinda like my COMPAQ 3970, it has all the good features youre looking for a pocket PC, bluetooth, picture viewer, calendar, notes, contacts, tasks... but maybe thats all there is. I enjoyed it for almost a year, im just weary about how COMPAQ will adress this issue, "WHAT IF MY COMPAQ WOULD BE DEAD AFTER A YEAR", this problem keeps buggin me, any problems with my compaq would be a disater, its a timebomb waiting to explode and shatter all your informations into dirt. THe problem is the battery it works well now, but what will happen in the future. Early Adopters Pick: December 2002. The first and only Pocket PC handheld PDA with integrated wireless LAN (802.11b), Bluetooth technology, and biometric fingerprint security. The powerful HP iPAQ H5455 Pocket PC features a 400 MHz Intel XScale processor, 64 MB RAM, 48 MB flash ROM, and a Secure Digital memory slot for additional memory. Its display is a color transflective TFT LCD, 3.78-inch, low-power, 16-bit touch screen, capable of displaying more than 65,000 colors with 240 x 320 resolution and .24 mm dot pitch. The H5455 is a ready-to-go wireless solution with universal remote control and Bluetooth technology capability, along with cool applications such as WEB, instant messaging, MP3, and online games. It's also compatible with popular Microsoft applications such as Outlook, Word, and Excel. Programs installed on the Pocket PC include: Microsoft Windows CE, Calendar, Contacts, Tasks, Voice Recorder, Notes, Pocket Word, Pocket Excel, Pocket Internet Explorer, Windows Media Player 8 (for playing MP3 files), Calculator, Solitaire, Inbox (for e-mail), Microsoft Reader (for reading eBooks), File Explorer, MSN Messenger, Terminal Services Client, VPN Client, Infrared Beaming, Clock, Align Screen, Infrared Beaming Memory, Volume Control, iPAQ Task Manager, iPAQ File Store, iPAQ Backup, and iPAQ Image Viewer. 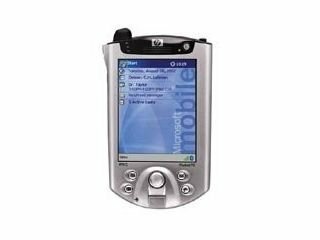 The iPAQ H5455 comes with a slim removable battery, a USB synchronization cable, an AC adapter, a charging adapter (tethered to the AC adapter), a quick-start user's guide, and an HP iPAQ Pocket PC companion CD-ROM (with Microsoft Outlook 2000, ActiveSync 3.5, add-on applications, and reference guide). The H5455 comes with a one-year limited warranty. 1. Its not reliable - requires hard resets occasionally, does not sync up occasionally, does strange things, battery life is low. Learn how to do a hard reset and try one whenever strange things occur (like the battery seems dead). 2. Its not that useful. Mail and calendar have to be synced up with corporate Outlook thru docking or bluetooth - no use of wifi or internet. Text entry via stylus or on screen keyboard is clumsy. Screen is not big enough for real web browsing. Unit is large and hard to carry on belt. Documentation is poor - you have a pile of brochures and addendums and a hardware manual on CD. Adding any communication technology, eg cellular, requires a bulky sleeve. Overall, it does not represent value for $ for me. However, I am comparing it to a RIM Blackberry that works with my company's enterprise email and calendar so your results may vary. Update: Had to return the unit. Too many resets and restores from disk, too many problems - not worth the hassle. This is not ready for prime time yet. These guys who are palm lovers just have a hard time switching to the Pocket PC! I am a switcher. The transition was tough at first back a couple of years ago. The Palm OS is surely faster and more user friendly but has much less to offer. This IPAQ is a powerful one and the screen quality, handwritting recognition and wifi options are unmatched by any Palm device. I have not found much use yet for the Bluetooth and the security features are good but I don't know that I need them. Still, what a great tool for word processing, spreadsheets, web surfing and more. Lighten up Palm boy! Big problems for the $$ - otherwise it could be great. 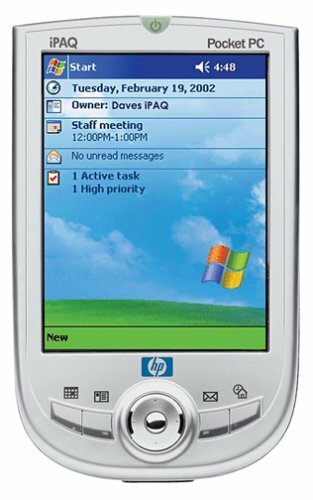 I purchased the iPaq 5455 one year ago, directly from HP when it first hit the market, paying $649 plus $200 for a 3 year top of the line warranty. I have had several problems with the unit. Starting with the display on the unit going out only after a month or two of receiving it. The next problem was with the battery loosing its charge. Most recently, I have been having the recurring problem of the unit locking up not powering on. And like others, I have never been able to sync my info wirelessly. I have placed several calls to tech support. I have troubleshooted the unit while on the phone with them and even sent the unit in for repair a month ago, in which I did not get a replacement unit, although my extended warranty states that I should. I received the unit back from repair and the documentation stated that no parts were replaced. Knowing that I definitely had a problem with the unit, I called tech support to see what was repaired. I was told a big lie that the battery was changed and the ENC part was replaced. Looking at my unit now, I see that it is the same battery that I had when I sent it in for repair. Thinking that all was fixed with my unit, I downloaded all of my information. The next day I experienced the same problem with the unit not powering on with the power button. I placed another call to tech support in which the tech and myself troubleshooted the unit. The tech told me to hard boot my unit which erased all of my data. I was told not to install the one 3rd party software that I had installed to monitor the situation. I once again reinstalled my information without the 3rd party software. Again, my unit would not power on. Again, I called tech support and angrily described my situation. Finally, the tech tells me that I will be sent a REFURBISHED unit. I received the refurbished unit two days ago and encountered the same problem once I loaded all of my data on to it. HP tech support has you to hard reset the unit to erase all data, which appears to make the unit work properly, but once the data is loaded, the problems begin. Today I called tech support and told them I am returning the refurbished replacement unit and keeping my original to see what their customer care department does to satisfy me. I purchased the unit because I felt it would be an asset to my busy professional life, but it has been nothing but a hassle. I have sent several email complaints to HP customer support and finally to the CEO Carly Fiorina. I got a reply email from her address stating that someone would be in contact with me. Each call and every email, I have gotten the same script of "we apologize for your inconvenience". The tech support department located in India is very unhelpful and they speak to you as if you were an idiot. The unit has some slick features, but right now I am very dissatisfied and frustrated. I got the HP5455 2 months ago. The battery life is horrible, interface is awkward, and form-factor too large.... After dealing with the thing for 2 months, I've spent another $500 to replace it with a new palm (which I love). Stay away from the HP5455. (1)I never got the biometric reader to work. Looking for a 15-inch multimedia monitor that delivers high performance, reliability, and great sound? The Compaq Presario MV540 with detachable monitor-powered JBL speakers is designed to offer crisp sound and the convenience of a digital audio player within a flat-square CRT system. Plus it includes an integrated microphone that incorporates built-in, high-quality voice recognition and easy-to-use onscreen menus for precise control of the digital display. The Presario MV540 has a resolution of 1,024 x 768 at a refresh rate of 60 Hz (lower resolutions offer higher refresh rates). The small size of the pixels, 0.28-millimeter AG (aperture grille) pitch, provides fine detail. The flat-square, polished monitor has 13.8 inches of viewable image area and antireflective, antiglare glass that ensures accuracy of display images and reduces eyestrain. The MV540's onscreen controls let you adjust brightness, contrast, degauss, horizontal and vertical size and position, parallelogram, trapezoid, and more. An illuminated push-button on/off control allows you to check the status of the unit, even in the dark. The sound system consists of a built-in audio amplifier, 3-pound stereo speakers with 3 watts RMS per channel, a headset connection, an integrated microphone, and an audio port. You can plug in your digital audio player and listen without starting your PC. I have had this monitor since 2000 and have never had a single problem with it. No humming sounds or smoke coming out and I have changed the resolution quite a few times. I highly recommend this item. This monitor is everything I expected from a Compaq product. Excellent picture quality and sound. I have never found another manufacturer who can match Compaq for sound quality. Another nice feature of Compaq monitors are the microphones that are built into the monitor, so there is no need to buy a desk-cluttering external. The microphone also works great with voice recognition software. This monitor replaced a Compaq Presario 1410 monitor that I have used for the last six years (still has better sound and picture than most new monitors, just figured it was time to update!). I had this monitor and it started to make a loud noise one night and I could smell a strong odor of copper wire burning eminating from it. The screen was black on the sides and white down the middle. When I hit the mouse to clear the screen and it started to make a shrill sound and I just pulled the plug. I had this for less than a year. If your kids have this in their room please take care. I'm the only one that used this. Compaq's iPAQ Pocket PC combines a 206 MHz Intel StrongARM processor,new hardware, and a sleek industrial design that fits in your hand to create apowerful and stylish PDA you can take anywhere. It offers 32 MB RAM and 16 MBROM--enough memory to hold a robust package of applications while leaving you alot of room for your own applications. The color TFT screen produces 4,086colors, and you can view the screen from many angles and in a variety oflighting situations. The Compaq iPAQ wraps the power of a Microsoft Windowsoperating system in a new interface designed for ease of use in a portableformat. Even if you've never used a computer or digital organizer, learning touse the Compaq iPAQ is easy. Other highlights of the Compaq iPAQ include a microphone and a speaker as wellas an audio-in jack. It features an infrared port for wireless data transfer.The Compaq iPAQ uses five buttons plus a five-way joystick. The iPAQ connects toeither USB or serial ports. The iPAQ allows you to input data in your ownhandwriting, by soft keyboard, by voice recorder, or through inking. Bothaudible and visual alarms alert you when you have a scheduled event. What sets this Pocket PC apart from similar devices on the market is itssleevelike expansion-pack system. The expansion-pack system allows you addfunctionality to suit your particular needs. Expansion-pack options currentlyinclude a CompactFlash pack, the ability to attach a CompactFlash card slot toyour iPAQ, an executive leather and PC Card expansion pack, and a water-resistantsports pack. In the future, Compaq plans to release a globalpositioning system pack, so you can turn your iPAQ pocket PC into a GPS unit. The Compaq iPAQ is sporty and small. At 5.11 by 3.28 by 0.62 inches and 6ounces, it fits in your hand or slides into your pocket with ease. Don't let thesize fool you into thinking you don't get many applications with your iPAQ. Youreceive a great deal of Microsoft software, such as Pocket versions of Word,Excel, Internet Explorer, and Outlook as well as the full desktop version ofOutlook 2000. Compaq also has built-in utilities so that frequent actions--suchas switching between tasks, adjusting volume, or changing backlighting--are onlya click away. Compaq offers a one-year warranty on parts and labor for the iPAQ. One, it looks the best out of all of the PDA's. It has a sleek, futuristic, design, unlike the Jornada, for example, which is just plain black. Two, the stylus can store inside of the body, so there is less of a chance of losing it and you don't have to carry it around separately. Three, It has an Mp3 player, which is one of the main reasons I picked it over the Palm and Visor, in which an Mp3 expansion costs as much as the PDA itself. Four, the writing area is retractable and there is an on-screen keyboard; the Palm and Visor don't have the keyboard, and the writing area takes up precious screen space. Five, the processor is an Intel Strong ARM 206MHz; the other pocket PC's only have 133MHz or lower, and they're not Intel, which is the best and most reliable processor. Six, it doubles as an E-book, you can read books on your iPaq with Microsoft Reader and download them from numerous websites, even a thesaurus and dictionary; the Palm doesn't have this feature and the Visor expansion is expensive and you can only choose from a selection of four books. Seven, one of the most important factors in my buying the iPaq is the color screen; the resolution is the best out there, especially compared to the color Palm and Visor PDA's, which are expensive and have very low resolution. Not much of an improvement from a Game Boy. I went through excruciating research on the other PDA's before I decided on the iPaq, visiting Casio, HP, Visor, Palm, and Compaq. 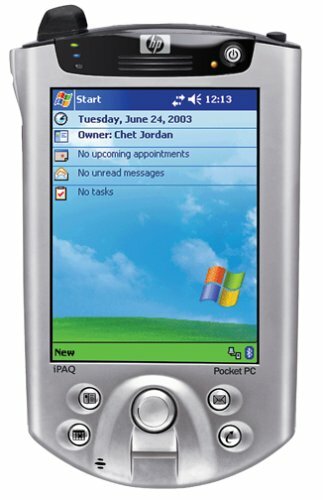 The Palm and Visor I ruled out immediately after seeing the capability of the Pocket PC's. I looked at CNET, Epinions, and PDA Buzz, and went to my local Best Buy, CompUSA, and Circuit City. I saw that it got high praise from many electronics and technology magazines, such as Best of the Year from Popular Science. It took me 2 weeks before my final decision. That was two weeks too late, into the middle of the Christmas shopping frenzy. Almost every retailer was out because of the popularity of the iPaq and on eBay, it cost around $600-$700. I finally snagged it at a Brandsmart USA, it was the last one. A very useful feature is AvantGo, which is included. You can load your favorite web site onto your iPaq for viewing anywhere. Also, you can read the Wall Street Journal, the New York Times, USAToday, you can play Jeopardy from SonyStation, you can access Yahoo(with movies, news, sports, stocks, etc. ), and thousands of other sites. There are many games and lots of software that you can download for it, like Flight Simulator. I am very happy with my iPaq, and I would suggest it to anyone. It's good for the music lover, disorganized person, businessman, etc. 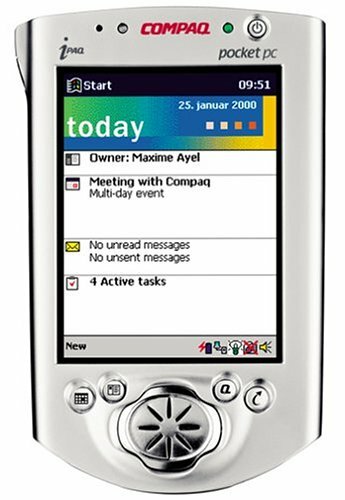 The Compaq iPAQ H3660 is a high-end palmtop device for both personal and professional applications. With its integrated comfportably sized memory of 64MB it stands out above many of its competitors (newer models available with even more memory) and can also be easily expanded using appropriate memory cards. The brilliant and well-lighted TFT display is easily read under any cirmcumstances (even bright daylight), and the touch screen and stylus pen make standard (short) input hassle-free. Handwriting recognition is very good, can be adapted to your personal hand. For more significant amounts of text, a fold-up keyboard should be used (but for serious word-processing, better use a full-fledged notebook instead). Not only windows can be run on this little machine, it is also LINUX compatible and can be used for serious UNIX Systems Administration using wireless add-ons. Special Linux version available: best of them, LISA Systems' iPAQ that comes pre-installed with mLinux 1.0 for advanced users. A highly interesting special for System Developers and IT pros. ... 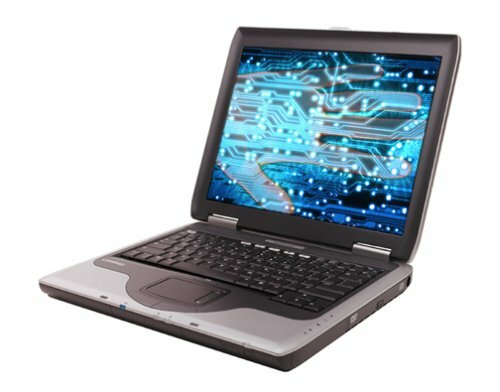 The free Open Source LINUX Operating System is now available to palmtop computers! 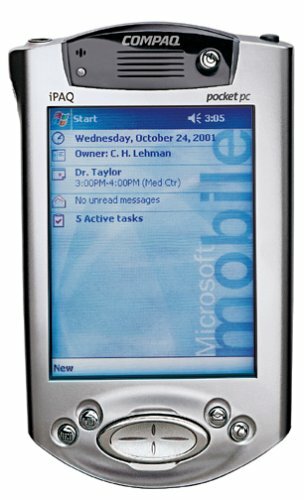 iPAQ with Windows integrates easily with MS-Outlook. The LINUX version supports synchronisation with appropriate LINUX applications. Either way, you get a highly professional palmtop computer connecting to your desktop and existing infrastructure. Dont listen to other ppls reviews. This is a great product. DUST DOES NOT ENTER THE SCREEN. People saying that is incorrect. What was behind the screen had nothing to do with dust. Compaq had a problem with a company in Taiwan that installs the screen. Do to poor work tiny glass fragments were left behind. That is what the so called "dust" is. This problem has been fixed with all the new iPaqs. Amazon.com only sells new ones, their will NOT be a problem with the screen. Microsoft activesync has a problem when other usb devices are in the computer. I found Microsoft ridiculous when you call user support. Your best bet is to call compaq where they will give a solution that works perfectly. There is a lot of softweare for the ipaq out, and much more coming. For gamers, go to PocketGamer.org for all the gaming news. You can get great emulators to play all the old Nintendo and SuperNintendo games. I recomend the IBM microdrive or if that is too expensive get the Viking cf card. This is by far the best Pocket PC on the line. The 3630 and the 3650 are the exact same product w/ ho differences what so all. I called Compaq to confirm this. The only difference w/ the new compaq 3635 is the cf card that comes w/ it. The new one costs 100 dollars more, where you can buy a cf expansion pack for 35 dollars. I recomend getting the 3635 or 3650. I own a Casio em-500 for a month. I'm glad that I had picked the em-500 instead of ipaq. From ipqa's user reviews, it seams there are quite a few problems about this ipaq PDA, such as activ sync is unstable, dust enters to the display. But the casio em-500(or e-125) never have such problems, They are very stable and the activesync work very well. If you go to read em-500 or e- 125's user reviews( I strongly recommend you do so), there's no those complains at all. 1. Display. Casio displayes over 65,000 colors and ipaq has 4,086. For those of you who cares of color and picture quality, you know the difference. The casio delivers better picture quality indoors. Because ipaq uses different display technology, it has much better display out doors. You can hardly see casio's screen when out door an under the sun. So you have to thing if you use your PDA out doors more or if you mostly use it in indoor environment. 2. Ipaq have a faster CPU speed according to the tech feature. I didn't acutally test them side by side for the speed. But after one month of using my em-500, I thing the casio em-500's speed is very fast, it runs all my applications very quick and smooth. So I think the ipaq should be ever faster too. Bottom line, read both ipaq and casio e-125(orem-500)'s users review and go to the shop to compare both before you spend your money. They are not cheep. 1. many times (almost every time I switch the machine on) the screen is "back to front" and you must restart the machine until it comes back. 2. the screen is not sealed properly so dust can come in from the stylus hole and get between the screen and the plastic cover. 3.the joystick works in a special signal to the processor which makes it impossible to move to an angle or to use two buttons at once which takes all the fun out of games. I heard Microsoft is working on solving this problem. after checking out about these problems I was told that Compaq knows all about them all over the world and working to fix them and that most of them are caused from putting the ipaq in the pocket and sitting on it (which I did).. I contacted Compaq in Israel and got great support and was told to bring the ipaq in and they will take care of all the problems, I know that in the U.S. Compaq sends you home a special box to send it in to be fixed or replaced. My recommendation is WAIT, I heard a new model is about to come out soon with 400 and 500 mhz, and with more built in memory, and you should wait for these problems to be fixed. The computer actually works pretty well, is easy to set up, and fast enough for all the applications we're likely to run on it (including a full-featured implementation of Go). It's also pretty comfortable to use. With the security problems of wi-fi and other wireless options, and limited appicability of BlueTooth, the more expensive versions didn't make a lot of sense. It's not for FPS gaming, but it works pretty well. Unfortunately, the glass touch screens are ridiculously fragile. Ours developed a crack across one corner of the screen after a couple of months of use, rendering it useless. Although there is no evidence that the unit was dropped (pressure fracture? ), HP isn't even going to think about warranty coverage. Worse, they want about $15 less than the original price of the unit new in the box to replace the screen. I don't know how this compares to other PDA's, but this one is far, far too delicate to be a practical consumer item. Not recommended. I've had the chance to try out HP's attempt at a consumer-friendly Pocket PC, and they have a winner. Nearly as small and just as light as a Palm V, HP has packed a top-notch screen and almost all of the functionality you could possibly want into a handsome 4 oz. piece of electronics. * The battery doesn't last as long as Palm's, and you'll probably want to charge it at least every other day, every day if you use it extensively. You can get an extra battery, since the HP's is removable -- a real advantage in the long run, since you won't have to send the unit in for servicing a la the Palm and most other PDA models. * You want MP3s, you got 'em. Add a 256MB SD card, and you're off and running. The unit does contain an annoying headphone adapter jack, but such are the tradeoffs of small size PDAs (Palm has a similar issue on the similarly priced Tungsten E.) It's not an iPod, but it'll do. * You can also display small videos and pics, of course, but who really needs/wants to do this on a regular basis? I suppose if you are one of those annoying people who want to show everybody your latest baby photos, this will be just the ticket. * There is no wireless functionality out of the box. You can add it later, but if you really are looking for Bluetooth/Wi-Fi, you probably want a PDA with those features built in. That'll cost you, of course. * Is there such a thing as too small? The buttons on this Pocket PC take a bit getting used to compared to the large and in charge buttons on the older, bloated iPaqs of yesteryear. The four months I had this in working condition, it worked wonderfully well. I never had any problem with it. Unfortunately, that wasn't to last. I had it on its charger while I was working and next think I know, there's a crack in the glass about an inch up from the bottom of the screen. I had never dropped this PDA, I was always very careful while using it. There was no reason for this to happen, and it did so without any outside interference. And they really get you coming and going on this one. A replacement LCD screen with glass top (you can not buy the glass top alone for this model) is almost $200. That's about what the PDA costs in the first place! Since this happened to me, I have seen where several other people have complained of the exact same thing happening to them. This is obviously a product default, and I would never recommend that anyone buy this model. I can't vouch for any of the other HP models, but this one is a definite waste of money. Don't take the chance. NEVER EVER buy an iPAQ. I bought one, and what do you know, just one month later, I pick it up and the screen is cracked. I treat this thing better than I would a baby, and I did not drop it or do anything at all to it. So I call HP, they tell me to send it in, and what happens? They want $200 to fix it. Well, I thought that was obviously a bunch of bull since I had just paid $300 for it. Apparantly all the 19xx line is like this. If you buy iPAQ, you are a fool. They don't give a crap about their customers, I am 17 with a temp job, how am I expected to come up with $200 to fix it, I spent gd long enought coming up with the $300. I recently got an HP 1935. I was turned on by its cheap price, and since this is my first Pocket PC, I didn't want to invest in something more expensive. It's very little and light. Although it's not the fastes PDA on the market, I don't think there's really big difference since it takes not even a second for most things to load up. It lacks the Bluetooth which it has a Irda beaming thing. So you don't really need if you don't have anything else Bluetooth enabled.